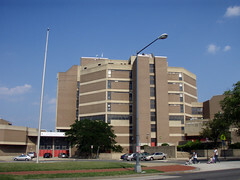 This is Dunbar High as it stands today, a brutalist soulless monolith that dominates the nearby architecture at 1301 New Jersey Ave NW near Truxton Circle. This morning, a new Dunbar was announced, a $100M improvement of the site that incorporates elements of the original 1917 Dunbar school. Included are brand new athletic facilities, an O Street pedestrian promenade, and “The Armory” designed to be the beating heart of the new Dunbar. The new site is scheduled to open for the 2013-2014 Academic year, and construction will be done such that the students will not need to be moved to another building in the interim. Bill Turque of the Post has a longer look at what that process would be like. In addition, you can view PDF concept drawings of Dunbar online. didn’t they just finish a new state of the art field within the past few years? are they going to tear it down and move it? They just finished their current field in 2007. It will be torn up. There will be another one built on the site of the demolished building.